Hockey is back in Tampa Bay, as the Tampa Bay Lightning kicked off their preseason Tuesday against the Carolina Hurricanes at Amalie Arena. The lineup featured mostly NHL regulars, and many fans out there are so desperate for the season to start that there will be plenty of takes (and overreactions). But, it is just preseason, and for a team with just one or two roster spots realistically in play, the on-ice performances won’t mean much and there's no reason to dwell much on their 4-1 loss to the Carolina Hurricanes. So as our coverage of the Lightning kicks off here at 813area, we’ll instead look at the most intriguing storylines to pay attention to as October 6th approaches. The Lightning made plenty of noise this offseason, signing big-money extensions to MVP candidate Nikita Kucherov, forward J.T. Miller and defenseman Ryan McDonagh, but the loudest move came last week when they announced a personnel change. No, not that personnel change. Unfortunately, that had an unsatisfactory ending for Bolts fans. On September 11th owner Jeff Vinik announced that long-time General Manager Steve Yzerman would be stepping aside into a senior advisory role, and that former Assistant General Manager Julien BriseBois would be taking over as GM effective immediately. The news came as a surprise, not just for fans but for the players as well. BriseBois has served as the Assistant General Manager for Yzerman’s entire tenure. In addition, he was the General Manager of Tampa Bay’s AHL affiliates, the Norfolk Admirals (2010-2012) and the Syracuse Crunch (2012-present). The Admirals won the Calder Cup, the AHL championship, in 2012, with a team that featured current Lightning forwards Tyler Johnson, Ondrej Palat, Alex Killorn and Cory Conacher along with current Lightning head coach Jon Cooper. The Crunch have appeared in the Calder Cup Finals twice, in 2013 and 2017, since the Lightning switched affiliates. Yzerman has had many memorable moments during his time in charge. He turned a difficult situation with Martin St. Louis into an opportunity, obtaining an important leader in Ryan Callahan at the deadline in 2014. He’s had some home runs, such as trading Cory Conacher for future All-Star goaltender Ben Bishop in 2013. He’s also had some mistakes, most notably passing on Nashville Predators superstar winger Filip Forsberg at the 2012 entry draft in favor of Slater Koekkoek. But he will be remembered most for the impact he’s made throughout the Lightning organization. Yzerman was hired in May of 2010, replacing Brian Lawton and becoming the sixth GM in the Lightning’s then 18 years of existence. He led the team to the Eastern Conference Finals in just his first year, winning a playoff series for the first time since capturing the Stanley Cup in 2004. He then guided the team through a major transitional period, parting ways with two franchise legends (and team captains) in Vincent Lecavalier and St. Louis, on the way to building a perennial cup contender that has made the Conference Finals three times in the last four seasons. Yzerman has cited personal reasons for the change of positions. He still has one year left on his contract, and will fulfill that commitment in a senior advisory role to BriseBois and hockey operations. 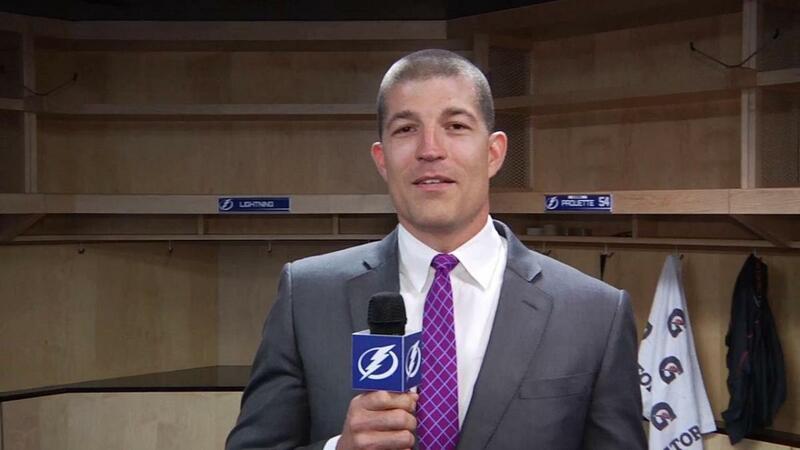 As Lightning Director of Broadcasting and Programming Matt Sammon put it, it’s more of a “stepping aside” rather than stepping down. Hey Tampa Bay do you want more Lightning coverage? How about the Bulls, Bucs and local high schools? Keep your eyes on 813area and make sure to register. We'll send you updates to your mobile device... and it’s free!